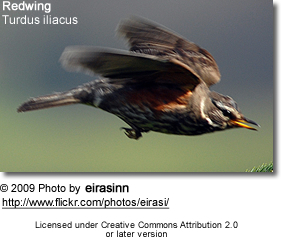 The Redwing (Turdus iliacus) is a bird in the thrush family Turdidae. 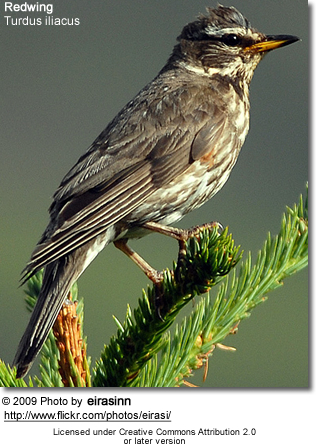 This species is not closely related to the Red-winged Blackbird, a North American species, which is an icterid, family Icteridae. It breeds in northern regions of Europe and Asia, from Iceland south to northernmost Scotland, and east through Scandinavia, the Baltic States, northern Poland and Belarus, and through most of Russia to about 165°E in Chukotka Autonomous Okrug. In recent years it has expanded its range slightly, both in eastern Europe where it now breeds south into northern Ukraine, and in southern Greenland, where the Qaqortoq area was colonised in 1990–1991. It is often replaced by the related Ring Ouzel in areas of higher altitude. It is migratory, wintering in western, central and southern Europe, northwest Africa, and southwest Asia east to northern Iran. Birds in some parts of the west of the breeding range (particularly southwestern Norway) may be resident, not migrating at all, while those in the far east of the range migrate at least 6,500–7,000 km to reach their wintering grounds. There are two records of vagrants from the northeast coast of North America. Migrating and wintering birds often form loose flocks of ten to 200 or more birds, often feeding together with Fieldfares, Common Blackbirds, and Starlings, sometimes also with Mistle Thrushes, Song Thrushes, and Ring Ouzels. 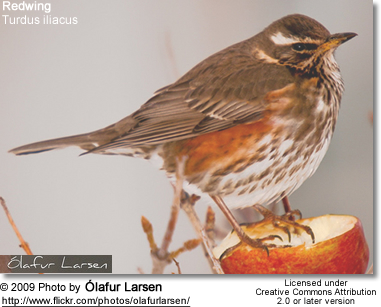 Unlike the Song Thrush, the more nomadic Redwing, does not tend to return regularly to the same wintering areas. 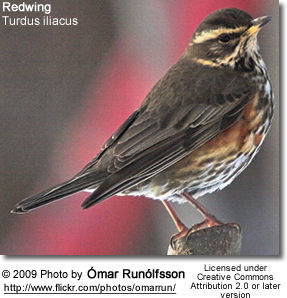 The Redwing has an extensive range, estimated at 10 million square kilometres (3.8 million square miles), and a large population, including an estimated 31 to 42 million individuals in Europe alone. The species is not believed to approach the thresholds for the population decline criterion of the IUCN Red List (i.e., declining more than 30% in ten years or three generations), and is therefore evaluated as Least Concern. Numbers can be adversely affected by severe winters, which may cause heavy mortality, and cold wet summers, which reduce breeding success. It breeds in conifer and birch forest and tundra. 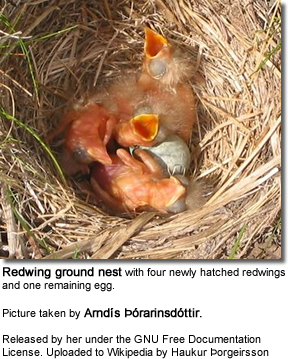 Redwings nest in shrubs or on the ground, laying four to six eggs in a neat nest. The eggs are typically 2.6 x 1.9 centimetres in size and weigh 4.6 grammes, of which 5% is shell, and hatch after 12–13 days. The chicks fledge at 12–15 days, but the young remain dependent on their parents for a further 14 days. 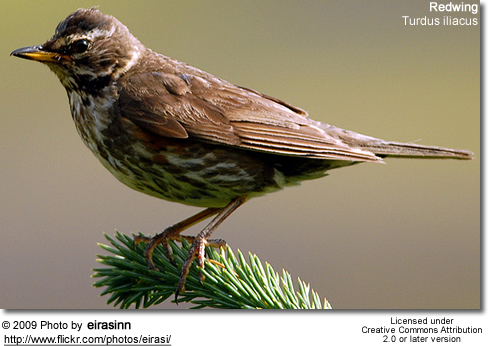 The Redwing is slightly smaller than the related Song Thrush. It is 20–24 cm long with a wingspan of 33–34.5 cm and a weight of 50–75 g.
Males and females look alike, with plain brown backs and with dark brown spots on the white underparts. The most striking identification features are the red flanks and underwing, and the creamy white stripe above the eye. It is omnivorous, eating a wide range of insects and earthworms all year, supplemented by berries in autumn and winter, particularly of rowan Sorbus aucuparia and hawthorn Crataegus monogyna. The male has a varied short song, and a whistling flight call. The English name derives from the bird's red underwing. 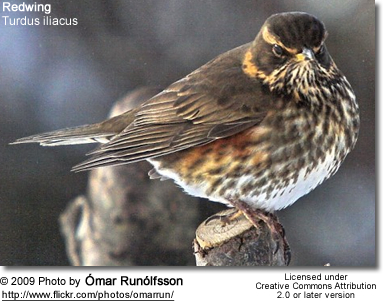 It is not closely related to the Red-winged Blackbird, a North American species sometimes nicknamed "redwing", which is an icterid, not a thrush. 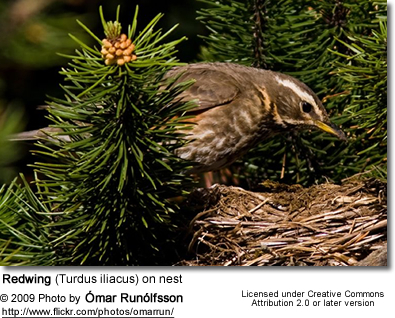 The binomial name derives from the Latin words Turdus, "thrush", and ile "flank". T. i. iliacus, the nominate subspecies described by Linnaeus, which breeds in mainland Eurasia. T. i. coburni described by Richard Bowdler Sharpe in 1901, which breeds in Iceland and the Faroe Islands and winters from western Scotland and Ireland south to northern Spain. It is darker overall, and marginally larger than the nominate form.